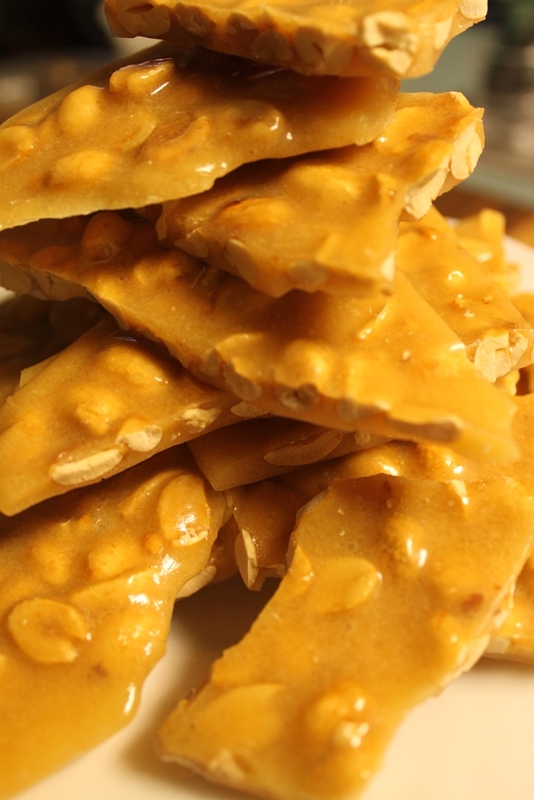 Peanut Brittle | Rosetta Bakes! In a large microwave safe bowl, put in 1 cup sugar, 1 cup dry roasted peanuts, and 1/2 cup heavy corn syrup (White Karo). Stir until mixed well. Place bowl in a microwave on high for 3 minutes. Bring out of microwave carefully (mixture will be hot) and stir. Place back in microwave for 4 minutes, then bring out and stir really good, then add 1 teaspoon butter and 1 teaspoon vanilla and mix well. Place back in microwave for an additional 2 minutes. Take out of microwave and immediately stir in baking soda. Mixture will quickly foam up. Stir very quickly and pour into a lightly onto a lightly buttered cookie pan…IMMEDIATELY smooth out on to cookie sheet. Allow to cool completely. Once pan has cooled, simply tap cookie sheet on the counter and peanut brittle should break onto pieces.